We had been eagerly awaiting this exhibit (see previous post) and headed uptown yesterday to check it out. The Transfinite, an interactive installation by Ryoji Ikeda (Japan’s leading electronic composer and visual artist), is not only very cool, but surprisingly, an incredibly soothing experience. One would think that the test pattern visuals along with the loud electronic sounds and strobes might have the opposite effect but, at least for us, and seemingly, those around us, it was almost hypnotically relaxing. People were lying on the floor for long stretches completely entranced by the spectacle and immersed in the moment. It is important to note that the show is made up of three parts: test pattern; data.tron; and data.scan. We almost missed the two data sections which were on the other side of the test pattern wall. Below are some short videos to get a sense of the show, but it definitely is more one of those you-had-to-be-there situations. Just to clarify, Em and Dan’s chatter in that last clip is not part of Ikeda’s soundtrack… If you have sound issues with the video clips, try watching full-screen. The Transfinite is at the Park Avenue Armory in NYC through June 11, 2011. The admission is a bit pricey at $12, but if you stay a while and take it all in, we think (though it would be more palatable at half the price) it’s still worth it. This entry was posted in Art, Event, Interaction Design, Just Plain Cool, NYC, Stuff We Like. Bookmark the permalink. Nils! I have heard and it makes me so happy. And, yes, the tiny-seated-silhouette look works for Daniela. 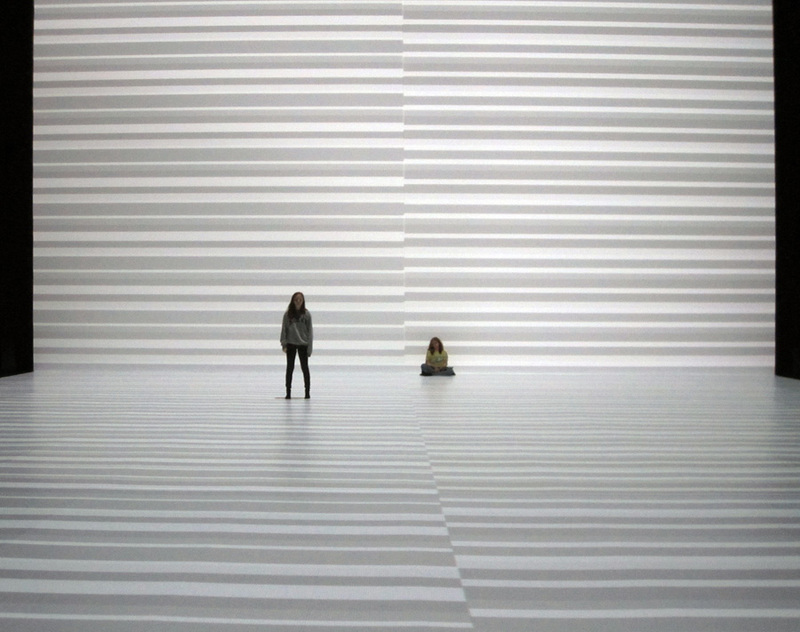 Pingback: Ryoji Ikeda’s The Transfinite follow-up » Design You Trust – Social design inspiration!